Richard Corbridge, Task Force leader in the DHS has been awarded the O’Moore medal! 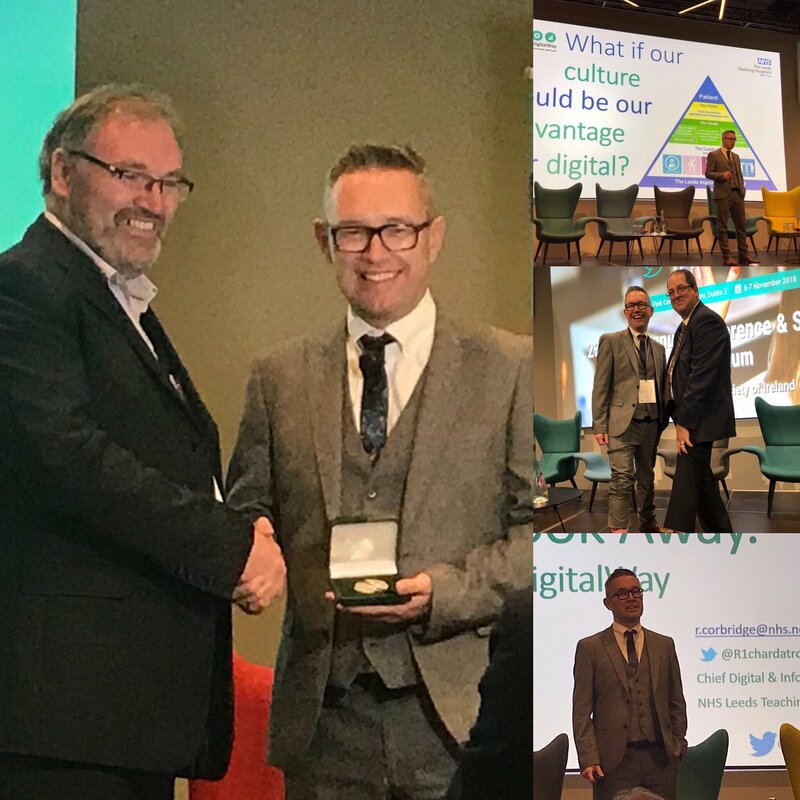 On the 7th November 2018, at the Annual Health Informatics Society of Ireland Conference in Croke Park, Prof of Health Informatics and Group CIO Neil O’Hare presented the O’Moore Medal to Richard Corbridge in recognition of his significant contribution to the digital transformation of the Health Service Executive (HSE). The Healthcare Informatics Society of Ireland has awarded the O’Moore Medal as appropriate to individuals or organisations that have made a major contribution to Healthcare Informatics. Under his leadership between 2014 -2017, eHealth Ireland successfully implemented a unique identifier for health, fully digitized the referral process, put in place Irelands first clinical information officer’s council, began the first epilepsy genomic sequencing programme globally, put in place the ability to implement a national lab system and a national maternity EHR. He brought a focus to the delivery of several key strategic programmes including the beginning of ePharmacy for Ireland, digital cancer care and a cloud first strategy. He was instrumental in the reform of the Irish healthcare technology system that has subsequently seen a plethora of awards and recognitions for the team. “To receive the O’Moore medal is a wonderful honour. To help drive and be part of such a significant period of development in Irelands Health Service is one I will always hold as my proudest moments, not least because of the fantastic team that are still helping to advance what we started back in 2014. The O’Moore medal is a circle that represents making a change. For me, the circle should be broken into four and passed to Joyce Shaw who made the work happen. To Fran Thompson who did the hard work so much of the time. To Kevin Conlon who was the brute force behind eHealth Ireland, and not forgetting Tony O’Brien who made sure that if we were going to start the journey then we would start the journey now”.